After an early start to the day and a brief stint with the car rental company, the LEAP Ambassadors were ready to begin their annual retreat. This time, we set off toward Houston for a fun and enriching weekend-long tour of the city. While our focus was on becoming better ambassadors, there were a few exciting events in the itinerary that we were very much looking forward to. …and some decorated on the plate with unique sauces! While the entire spread was delectable, the kingklip and bobotie was a table favorite. The LEAP Ambassadors also had the pleasure of eating with former Ambassador Bianca and catch us all up on her life since she has graduated. She was able to offer advice and insight into her career in the fraud department at Woodforest National Bank. Her stories about her work made for interesting table talk among us and, before long, the main course was over and out came desert. We ordered the “Desert Trio,” a sampler of chocolate mousse, Melk tart (South African crème brûlée), and sticky toffee pudding. For this, there was no consensus on which dessert was the best. After lunch, the Ambassadors headed towards Ice at the Galleria, the ice rink that is filled with people year-round. All Ambassadors except Ilexus have ice skated before, but everyone struggled with it, some more than others. …we eventually enjoyed gliding through the rink and showing off some of our “skills”. Some guidance and working as a team were required (insert individual pictures of us holding hands and skating) to make sure we didn’t fall. When we left the rink, we felt a wave of exhaustion rush over us, but the day wasn’t over yet! After showing off our grace on the ice rink, we made our way to “Murder by The Book”, a local Houston bookstore filled with copious mystery, murder, and crime books. It is one of the oldest and largest bookstores that specializes in mystery books. After exploring the shelves, we found books that piqued our interest and became captivated in the works of certain authors such as Stephen King and Courtney Summers, while also catching a presentation by author Amy Stewart…. And when we left, we each left with a novel that caught our interest. For our next stop, we were honored to see the work of one of the most influential American architects, Philip Johnson. The Chapel of St. Basil, which is located on The University of St. Thomas’ campus, exudes Modern and Post-Modern architecture styles, both of which Johnson is best known for. Complementing the Chapel is the Felice Babin Gueymard Memorial Garden. This garden is a monument to tranquility and reflection. It’s filled with three fountains that rest behind a labyrinth which is often used for meditation and prayer. Some of us spent many minutes taking the long journey to the center. After calming our minds in the Memorial Garden, we headed to the We Heart Houston sculpture by David Adickes – a tribute to the pride resonating from the locals that reside in the massive city. Last time we visited, it rested along I-10. It has since been moved to the promenade near 8th Wonder Brewery in east Downtown Houston to provide a safer place for picture taking. After what seemed like the fiftieth jump, we finally came out with a decent L.E.A.P picture. In the same location resides Adickes’ larger than life sculpture of The Beatles. Luckily, it was easier to take a picture with them without having to jump, plus we had Bianca as our photographer, so things came out wonderfully! Although many of the LEAP Ambassadors could not name all 4 members, at least they came out with new knowledge to show off to their peers when the time comes. In order to make it to our final event of the day on time, we had to sacrifice a sit-down meal for the sake of efficiency. Fortunately for us, this provided the alternative of getting delicious smoothies from Nékter Juice Bar – a smoothie chain just around the corner from our hotel in Downtown. After grabbing our smoothies and changing into more formal clothes, we made our way to the Alley Theater. 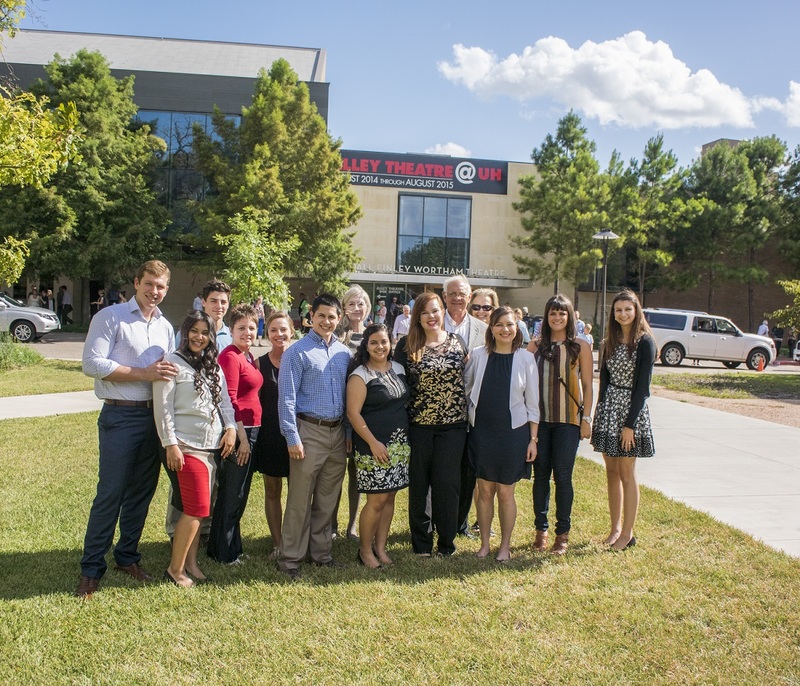 The Alley Theater opened in 1968 and is now a nationally recognized non-profit theater led by Interim Artistic Director James Black and Managing Director Dean R. Gladden. The showing at the time was Twelfth Night, a comedy written by William Shakespeare around 1601. When we arrived, we took a quick selfie outside and then made our way to our seats. As we walked into the theatre, our excitement grew as we saw the setup of the stage. There was a big white wall with a staircase leading down. The stage was surrounded by a pool of water with a stone path that bridged the main stage with the outside edge. We could not wait to see how the play would incorporate it. There was a loud crack of lighting and then rain fell from the ceiling into the pool of water around the stage marking the beginning of the play. The next two hours were filled with astonishment, impressiveness, and lots of laughter. It was quite late by the end of the play, so each of the Ambassadors were exhausted, but happy from having seen a great play and having had a great day. We returned to the hotel and settled into our rooms – excited for day 2 of the retreat. On Sunday, July 6th, the LEAP Ambassadors were enthusiastic to return to Houston. One of our favorite stops in Houston was the Moody Art Gallery, which Betty Moody generously opened to us on a Sunday. As on our previous visit to the gallery, Ms. Moody treated us to a great tour. The works exhibited in her gallery were from Flatbed Press in Austin, with work by some of the most talented of artists: Luis Jimenez, Terry Allen, and Mary McCleary, among others. Ms. Moody, displaying her immense knowledge in art, explained to us the various forms of printing showcased in the exhibit. To begin her tour, Ms. Moody pointed out one of Luis Jimenez’s prints, Abu Ghraib. Reminiscent of Francisco de Goya’s “The Disasters of War,” Jimenez took to oil-crayon to sketch out this depiction of contorted, enslaved bodies. Notice the mediums that he used to make this print. Jimenez, as Ms. Moody described, used a form of printmaking called lithography. In this process, the artist uses an oil-based crayon to draw onto Bavarian limestone (this limestone offers the greatest porosity). The surface is then washed with water. Following this rinse, an oil-soaked paper is placed on the surface of the limestone, pressed, and then removed from the stone. The reverse image from the limestone is then permanently inked on the paper. However, not every print in the exhibit was conceived through the same process. A series of small Terry Allen works, for example, were printed through line etching, aquatint, and chine collé. If these terms are foreign there is no need for alarm. For us, we had limited to no knowledge on print making. Thankfully, Ms. Moody had the patience and enthusiasm to describe all these various print-making processes. As complicated as these are, one thing that each print showed us was that, like any painting or drawing, prints are just another form of expression. No print is the same since each has wonderful, subtle differences that set them apart from each in the series. Similarly, our second visit to Ms. Moody’s spectacular gallery was filled with new attractions that we all marveled at. …and a wonderful bird created by Moody’s husband, Bill Steffy. After visiting Moody Gallery, we drove to one of the Ambassador’s favorite Houston restaurants, the Black Walnut Café. There we met Junior Fellow/LEAP Alumni Austin Campbell, Justin Beiser and his fiancee Chelsea Halblieb. Ms. Moody and Alex Galvan also joined us, which added to the conversation and fun! Ambassadors sampled dishes such as the French dip sandwich, the signature grilled chicken breast topped with pico de gallo and walnuts, as well as the spicy chicken jalapeño pasta. Our group enjoyed visiting with alumni and sharing stories over a tasty meal. Some even decided to indulge in dessert! After our bellies were full, we headed to the Alley Theatre, eager to see The 39 Steps. Written by Patrick Barlow, The 39 Steps is a satiric farce of all things Alfred Hitchcock. Bearing the same name as the Hitchcock thriller, the play The 39 Steps loosely follows the same plot of the movie: an innocent man is framed for a murder he did not commit and must now clear his name, revealing the mystery of the allusive ring of spies “The 39 Steps” along the way. There are 150 roles in the play, but only four cast members, making for a whimsical adventure full of laughter and fun. Some of us had never been to the Alley Theatre and this performance made the visit all the more special. In the intimate setting of the theatre, we had the chance to appreciate every comic bit with more enthusiasm. As said before, the play was performed by four actors (three male and one female). But that did not mean that there were only four characters. These four actors wore many hats (figuratively and literally). Incompetent cops, murderous spies, farmers, and other comic personas were all played by this small team of actors. The ability of these actors to switch roles from one line to the next, personified at times by the mere switch of a hat, made the performance a spectacular scene of comedy. But apart from the physical humor and comical bits, what added to the comedy of the play were the occasional references at Hitchcock films. Through satiric recreations of the shower scene from Psycho, the plane scene from North by Northwest, or references to Vertigo, Strangers on a Train, and other classic films from the “Master of Suspense”, the play kept Hitchcock fans entertained with the cleverly incorporated puns. The play’s non-stop silliness kept us at a state of uninterrupted guffaw for the whole two or so hours. Alex was even heard saying “it’s not only the play making me laugh, hearing your giggles and chuckles makes me laugh even more.” Whether she was referring to Professor Yawn, Brian, Beatriz, or all three combined (all three could be heard laughing throughout the play) we are not sure of. What we are certain of is that The 39 Steps was a performance we will not so easily forget. At the end of the play, we caught our breath from the continuous laughter and grouped together for a photo-op with Alfred Hitchcock. Well, in reality it was just his famous silhouette, but we could all feel his imposing presence in the theatre. We said our farewells to our fellow alumni with a sense of melancholy. For Ryan Brim, who is heading off to college, we wished him luck on his notorious voyage to Arkansas. Without a shadow of a doubt, we are sure that his time in college will not make him psycho. And even though we do not encourage him to dial m for murder in case he feels vertigo on his first day of school, he is well aware that the LEAPsters are more than strangers on a train and can always count on us to cast a rope to pull him into our lifeboat. For the rest of us, we headed home after a fun-filled Sunday. Hopeful that we can come back for another visit to Moody Gallery and the Alley theatre, we now look forward to our next adventure at Big Bend. The summer is drawing to a close, but not without the LEAP Ambassadors making the most out of the last few days before the Fall semester begins. While many students take the summer off to enjoy the outdoors or family vacations, LEAP Center students stay engaged during the summer months through activities like the Outdoor Explorer program with the City of Huntsville’s Recreation Department or attending cultural outings such as this weekend’s “The Foreigner” expedition at the UH Theater. 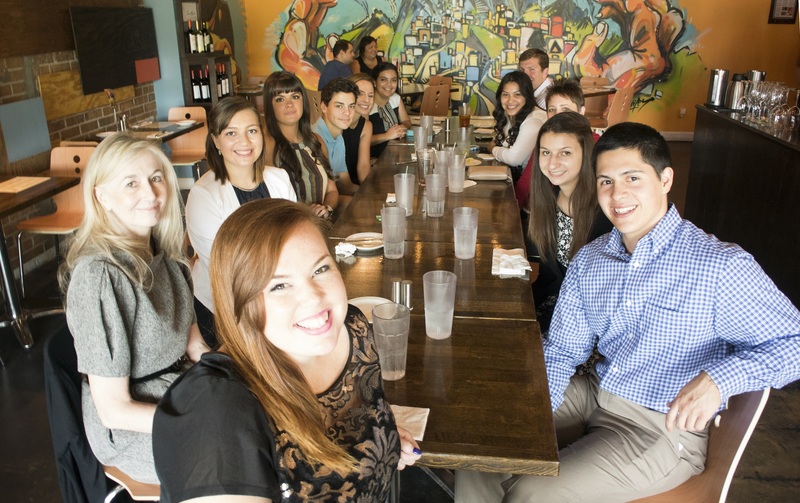 Led by Mike Yawn, LEAP students met for an appetizing lunch of South American food at Houston’s own Andes Café. Upon arrival, students were excited to meet former Junior Fellows Vice President, Laken Jenkins, graduate of South Texas College of Law. It was a great opportunity to discuss law school and for some, power lifting, with the Sam Houston grad. While considering interesting topics like summer plans and goals for the new school year, students perused the menu consisting of Peruvian, Ecuadorian, Columbian, Chilean, and Argentinian options. Students enjoyed entrees such as Bisteck A Caballo, a steak and egg dish, Pollo a la Brasa, a Peruvian chicken dish, and Lomo Saltado, Peruvian stirfry. 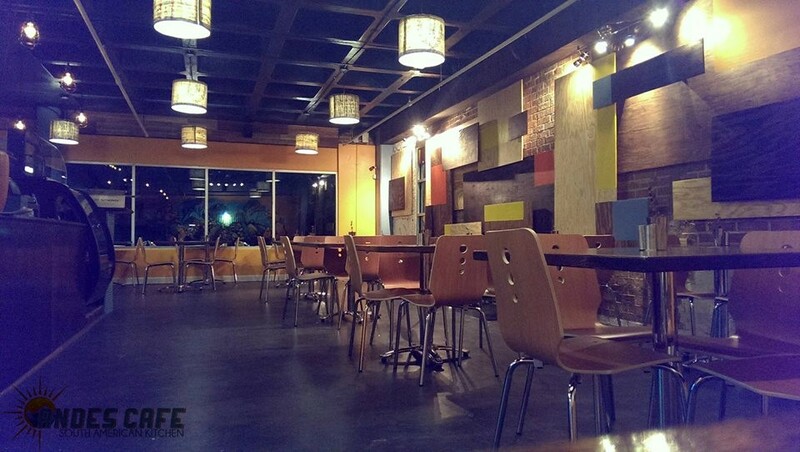 It was neat to have a taste of many different countries in such a quaint café residing in Houston’s downtown. Finishing our eclectic lunch, we left the café to caravan to the University of Houston, where the Alley Theatre is currently residing to accommodate $46.5 million worth of renovations at their usual home. We were excited to meet the mayor of Huntsville, Mac Woodward, and his wife, Leanne Woodward at the theater, where they joined us to watch the play. The play was written by Larry Shue, who interestingly enough died in a plane crash while adapting the play for the screen. “The Foreigner” was about a socially anxious Brit visiting a hunting lodge in Georgia with his comrade. In the company of strangers–each with their own backstory–this timid, doormat of a man comes into his own, transforming into an avid story-telling, English-learning, secret-keeping confidant of the lodge’s residents. It was hilarious! The play ended to a standing ovation, and we left the theater to converse about our favorite parts and laugh about the amusing accents. We took a picture to commemorate such a fun afternoon with the Woodwards and Ms. Jenkins and bid adieu to the University of Houston and each other while going our separate ways until next week, as some LEAP students look forward to a trip to Savannah, Georgia. Center for Law, Engagement, and Politics Blog at WordPress.com.